Julia Inserro is a mom of three littles, living abroad with her husband and a handful of cats. She is a writer, reader, photographer, and explorer. Nonni's Moon is her first children's book. Nonni's Moon by Julia Inserro is one of those feel good books for kids and parents alike. Beanie misses her grandmother who lives far, far away and wishes she could see her grandmother more. They settle on a new way to send messages to each other through a common means that all kids can appreciate. Beanie shares this with her teacher, who then decides to use it to send messages to her sister. Well, right away the reader has learned a new way to communicate with loved ones they seldom see. One of the first things that hooks the reader in Nonni's Moon by Julia Inserro is the artwork. Lucy Smith's illustrations capture our hearts. The illustrator won a Kidshelf cover design award. However, each and every page is captivating. Diversity is shared within the illustrations. The blended family is a mixture of Caucasian and Middle Eastern cultures. The story line seems at first to be a bedtime story. But, there's much, much more. There are "hidden" connections with the world of science and social issues. The obvious settings in the illustrations can lead to good discussions about different cultures. This would be a great means to introduce time zones and the earth's movements to young children, as well as use in a discussion of where the moon is when it can't be seen. Some of the repetitive phrases provide opportunities for children to be active participants by reading those as they are repeated throughout the book. 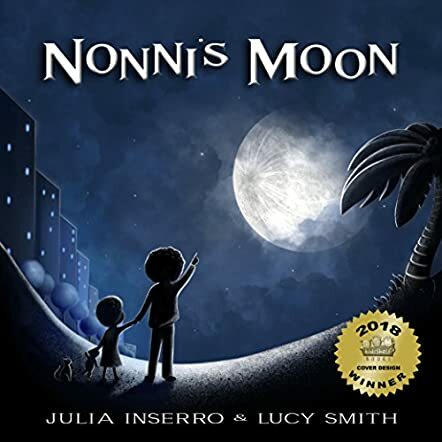 Nonni's Moon by Julia Inserro would be useful in the classroom and as a great Mother's Day gift for grandmothers.